The Travelite case fills a long-felt need by cellists. 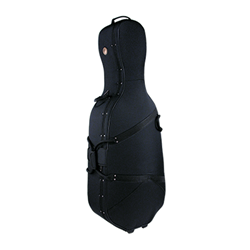 Light, strong and portable, the TL-20 was carefully designed to be the ideal cello travel case. It's made of a quality, modern material that not only protects and insulates the instrument. The exterior is comprised of durable ballistic nylon and includes detachable, padded shoulder straps.